C.J. Cherryh is an American science fiction and fantasy writer. She used her initials early in her writing career in order to disguise the fact that she was a female science fiction writer. She is the recipient of the Hugo Award and the Locus Award, among others, and has had an asteroid named after her. This story was first published in 1978 in the Darkover Grand Council Program Book IV and later in The Collected Short Fiction of C. J. Cherryh. It’s a fairly straight forward concept: traveling back in time and changing something past, will cause a ripple effect in the future. That’s what this story is. But, Oh. My. Goodness! did I get a headache trying to figure out if this was right and what was going on. The qhal discovered the first Gate. It was already made, but they made copies. These copies let them travel not to just distant planets, but to distant years. All the way up until the End of Time, which no one as dared had the courage to go through. The only rule about using the Gates is that no one is permitted to travel back in a Gate once they have gone forward (to prevent any time paradoxes from occurring). The qhals in charge of this responsibility are called Agents, and they are permitted to travel forward and backward. It is a strange life Agents live, having no true home or time, and Agent Harrh is starting to miss spending time with his family. 6 page story; the fist page and a half are an introduction to the qhals, the Gates, the Agents, and how time-travel works. I knew what Cherryh was saying with the gates, time travel, paradox, protects – but the “End of Time” and when the “Now” was, that took quite a bit of effort to grasp those exact details and meaning. The “Now” is how many years have gone by since the First Gate was discovered. This was what really gave me that head ache. Harry is from the year 1003 since First Gate. Makes perfect sense. But the Now, is currently the year 5045 since First Gate discover… How is that possible to know? If time is continuous on one time line, and they have the ability to go froward and back, from any gate, to any time, then how could you possibly know when the real Now is? Every year since First Gate should be considered the Now. Unless I missed something from that intro paragraph, the only explanation I can think of that would give someone that knowledge, would be if each Agent had some type of time recording machine, separate from the effects of time-travel, and has been counting up since First Gate. So, even though Agents can travel from the discovery of First Gate to year 6000. Spend 3 years there, and then go back to year 1738 😛 . Even thought they are in 1738, this device will tell them that the “Now” is actually 3 years since First Gate. However, I didn’t see any such device, so how Harrh has knowledge of the Now is a mystery to me. The actual story is about Harrh as he is home with his Wife and kids, and is reflecting on how – because of his job – he is missing a lot of time with his family, and how his wife has to tell people that he has to “travel” a lot for his job. This brings me to problem #2 that really racked by brain: if you can travel back and forward in time, how can you possibly be “missing” time with your family. If I travel from 2015 to 2020, then yes I have missed 5 years with my family. However, if after I’m done with my Agent, time-mending work, I just travel back to 2015, and for all my family knows, I went to the market to go some milk. They have no idea I traveled 5 year into the future and stayed there for 2 years. To them, I was gone 20 minutes. Yeah, I seem to have gotten extremely distracted with time travel aspect of the story but that’s because figuring out how the time travel worked was my favorite part of the story. I’m pretty sure there are several holes in the Gate technology, but I enjoyed thinking and debating about the Gates technology and if everything matched. If your comments contains a spoiler, please type “SPOILER:” at the start of your comment to alert fellow readers and comments. Thanks! I know I was very frustrated with Needle in a Timestack before (my review) because of the failure to explain or take into account how the time travel and butterfly effects it would cause, but that was because when you took into account the problems with how it was used, the story fell apart. In The Threads of Time, whether you can understand exactly if the Gates and Now make sense or how accurate they are, is completely irrelevant to the story. Cherry makes is clear that Gates let to you travel to different times, Harrh is an Agent who protects the Gates, and when something is changes in the past, it affects the future. The mechanics of time travel has zero impact with the plot. And the actual paradoxes that traveling into the past can create (aka the butterfly effects), that all made perfect sense to me and I really like how that played out in the story! Obviously, I probably delved deeper into this story than most will, but that’s what I like to do. Anytime a story involves the butterfly effect, I can’t help my self! XD If you take this story at face value though, you should very much enjoy this. 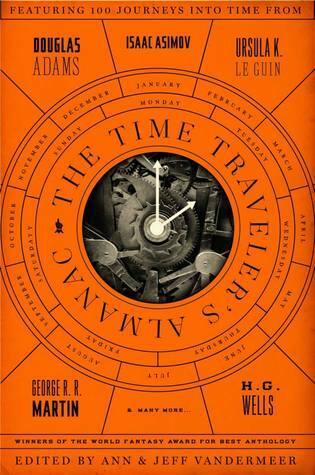 Be sure to check out my fellow time-travelers’ reviews! Wow! Sounds like you had fun reading this one! I think my brain might just implode trying to make sense of things…though it is great fun to do so when it comes to any time traveling story. What I love most about time travels stories that involve paradoxes is that you can go back and try to figure everything out and see how accurate it is! With this story, though, you don’t have to do what I did. Cherryh made it obvious what the Gates did, and that made sense for the plot – but she let out some stuff with the time travel. Wasn’t holes, but it felt like figuring out the mechanics was almost a part of the story. Wow, this collection is fast shaping up to be an anthology of “all these big name classic sci-fi and fantasy authors I’ve always wanted to read but haven’t yet”. Yep, in this case, I’ve always been curious about C.J. Cherryh (and ditto for next week’s Michael Swanwick!) I’m still very skeptical of how much “time traveling mechanics” can be crammed into 6 pages and still tell a story, like you I think I will spend way too much time distracted by how it worked too! Apparently you can read the whole book on there right now? The funny thing is, it really only explains the time travel in the first page in a half – very briefly. Then with what happens in the plot, you can delve more into the mechanics of how it works. The Gate lets you go back in time, and the plot shows how this creates the butterfly effect. However, with the “Now” and what exactly the effects are, you can try and puzzle things out more. I think that mystery was put in there on purpose for readers to delve on. Since most of these stories are older or were published in magazines, they are usually available online somewhere. I Googled next weeks story, and that link was the first pop up… and well, yeah, all the stories Haha! Great review, DJ! The time travel in this one was definitely interesting, and from the beginning the “Gates” really grabbed my attention.